Veteran actor and former Starship Enterprise captain Sir Patrick Stewart will warp into Fox's "Cosmos " Sunday night (March 30) as the voice of a famed astronomer who discovered Uranus. Stewart, who portrayed Captain Jean-Luc Picard on "Star Trek: The Next Generation," is one of two guest actors on the fourth episode of "Cosmos: A Spacetime Odyssey" hosted by astrophysicist Neil deGrasse Tyson. In the episode, dubbed "A Sky Full of Ghosts," Stewart will voice an animated version of astronomer William Herschel as part of a historical reenactment on the science-themed show. "Neil deGrasse Tyson sets off on the Ship of the Imagination to explore how light, time and gravity alter our perception of the universe," Fox's official episode announcement reads. "Travel back in time to 1809, when astronomer William Herschel (guest voice Stewart) observes how light plays tricks with time and gravity." William Herschel was a British astronomer in the late 1700s and early 1800s. In 1781, Herschel discovered the planet Uranus during a several nights of telescope observations. He initially campaigned to name the planet "Georgium Sidus" to honor the then King George III, but it was ultimately dubbed Uranus after the Greek god of the sky. There is another link between Patrick Stewart and Herschel besides "Cosmos." Both men have been knighted. Herschel was knighted by King George III in honor of his discovery and later named court astronomer. Stewart was knighted by Queen Elizabeth II in 2010. Another British acting veteran, Julian Ovenden (Charles Blake on "Downton Abbey"), will make an appearance on Sunday's "Cosmos" as Michael Faraday, the 19th century inventor of the electric motor. In "A Sky Full of Ghosts," "Cosmos" will recount how Faraday "discovered invisible fields of force that help him understand how gravity works," according to an episode description. 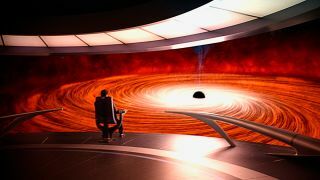 The 13-episode "Cosmos: A Spacetime Odyssey" is a 21st-century reboot of the 1980 miniseries "Cosmos: A Personal Voyage" hosted by famed astronomer Carl Sagan. As a young high school student preparing for college, Tyson visited Sagan at Cornell University. That event, which Tyson mentioned in the first episode of the new "Cosmos," will be revisited in Sunday night's "A Sky Full of Ghosts." "Cosmos: A Spacetime Odyssey" airs Sunday at 9 p.m. ET/PT on Fox. It will be rebroadcast with extra material on the National Geographic Channel on Monday (March 31) at 10 p.m. ET/PT. Check local listings.